Terminal Time is a history "engine:" a machine which combines historical events, ideological rhetoric, familiar forms of TV documentary, consumer polls and artificial intelligence algorithms to create hybrid cinematic experiences for mass audiences that are different every single time. History as it was meant to be told! History is in your hands! Through an audience response-measuring device (applause-meter) connected to a computer, viewing audiences respond to periodic questions reminiscent of marketing polls. These questions occur every 6 minutes during the story. The loudest applause determines the winning answer. 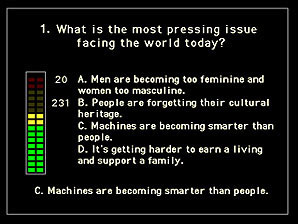 Your answers to these questions allow the computer program to create historical narratives that mirror and even exaggerate your biases and desires. Just clap, watch and enjoy. At long last, Terminal Time gives you the history you deserve! The Terminal Time engine uses the past 1,000 years of world history as "fuel" for creating these custom-made historical documentaries. Each program generated by the machine can be either projected on a screen or broadcast on television monitors. (Although the video and sound are constructed in the computer, the signal is compatible with standard video technology.) Each program lasts approximately 30 minutes. 1. Audience members find their seat and the "movie" begins with a short title sequence and introduction. 3. The history lesson begins with a 6 minute section of the movie covering the years 1000-1750. 5. the history lesson continues with a 6 minute section that covers the years 1750-1950. 7. The final 6 minute history lesson covering the years 1950-2000. 9. Often a discussion period with audiences and members of the Terminal Time team for 30 minutes.